The border wall between Mexico and the US will never be built. It would be a massive, ineffective boondoggle, and there are many reasons why it should never happen. But in the meantime the spectacle surrounding it is impossible to ignore. Our mercurial president is not the builder he claimed to be on the campaign trail; in fact he never was. It is true that what we build is a reflection of the times, and it is also true that the Trump brand has been an accurate reflection of contemporary social order. For the most part, those in the top 1% have built monuments to their personal wealth with no regard for taste or what one may call architectural theory. The wall would simply be another extension of the Trump brand. This year was the 50th anniversary of San Francisco’s Summer of Love- another mark on the timeline of social disruption. In 1967, people were talking about bringing walls down, not erecting new ones. A border wall back then would have been dots of brightly colored flowers, arrayed Christo-style along the entire length of the frontier. In fact, many of us who believed in a vision like this 50 years ago have been thinking that progress had been made towards it- until now. The wall may never be built, but the real damage the Trump administration is likely to inflict on the built environment will have lasting consequences. Pundits seem to think the one, and possibly only, issue politicians on both sides of the aisle can agree on is the need to improve this county’s infrastructure, and a builder in the Oval Office might be just the right person to make it happen. We need to be wary. Public-private partnerships will be offered up as the new paradigm for public works projects, and the guiding principles will be based on Donald Trump’s developer experience, i.e., Trumponomics. Typically, private developers seek out investors and rarely contribute capital to a project themselves – they use OPM (other people’s money). Construction is risky, and investors expect a higher rate of return than from safer investments such as municipal bonds, a conventional financing mechanism for public work. And in the private sector, bankruptcy is the exit strategy if a project doesn’t work out, a strategy Trump knows well and has repeatedly employed. Apply this rubric to the public sector, and the higher rates of return are siphoned off into the pockets of investors rather than contributing to the project itself. If the project fails, the US Treasury bails it out, making the investment essentially risk-free. The rich get richer. Furthermore, developers do not typically retain the completed work, which is not necessarily bad, given they have taken the project through its most risky stages, but the incentives to build quickly and cheaply are certainly there. The only assurances that a building will function properly come from regulation (planning and building codes) and the integrity of designers and contractors. 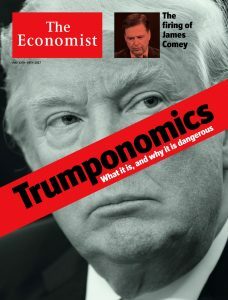 Trumponomics could lead to infrastructure akin to software in its beta stages, and we users would be at the mercy of something analogous to tech support. Add to this the culture of the likely players who would participate in this vision of making America great again. What we have seen so far are characters navigating with a moral compass in a magnetic field of an alternative universe. Like Trump, they probably think architects are a bunch of useless pinheads, so we are unlikely to have a seat at the decision-making table when the infrastructure roll-out plan is being developed. So what can we do? We can help improve the performance of the public sector; after all, it is the legitimate role of government to finance and build infrastructure. Other countries, like Japan and many European nations, have smoothly operating transit and clean streets while our infrastructure is looking like that of a dictatorship or broken democracy. We need to make sure regulations are not relaxed, especially those related to energy use, pollution, and climate change. We should be more savvy when it comes to building economics, and show our clients ways sustainable design can lead to real, marketable value. We have to keep our collective heads out of the sand and encourage our representatives in government, especially local government, to pass legislation with incentives for the private sector to build for the common good without diverting money into the pockets of the already wealthy. We must vote in every election and urge others to do so, too- those who abdicated their voting responsibility this past election are culpable for the mess we are in. Most importantly, we need to be optimistic. Keep the faith, baby (you may have to look this up). Jackson Rollings, “Half the companies contracted for the border wall defrauded the government,” The Architect’s Newspaper (September 19, 2017).